At two separate times, I’ve gone up to Tehachapi to spend time with my brother and both times found something I hadn’t been looking for, but very much needed – a sense of peace. The only catch? The date was set for Friday, December 14, at 2pm – right in the middle of my workday. But I did manage to get the day off and around 10am that morning, drove on up north. The Tehachapi Mountains rise out of the San Joaquin Valley on one side and Mojave on the other. The pass is at just under 4000 ft above sea level. Once I drove into the small town, the temperature gauge on my car read 38 degrees. The air was crisp and cold and perfect for December. The house was small and sweet and perfect for Tina, the lady that owns it. We putzed around, went to lunch, drove out to a ranch, and I had a three hour talk on writing and social media with two other writers (one has 4 books out and has been writing magazine articles for twenty years; the other is a screenwriter who has had several scripts produced and has just written a memoir about Hollywood). These guys were sharp, smart, funny as hell, and willing to listen to me, and I had a total blast. I hope to showcase both of them here on the blog in the future. After we’d talked each other out and darkness had fallen, we said goodbye to new friends and drove to the Souza Family Vineyards, where I bought two bottles of their Primitivo Zinfandel (because I’m a sucker for Zinfandel!). The 2007 won a silver medal, the 2009 won a bronze medal, and the 2010 won a gold medal, all at the San Francisco Chronical Wine Competition. 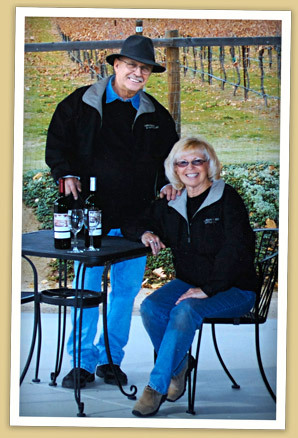 (I’m looking forward to showcasing the winery and the wines on a future Friday blog.) At the winery, we drank wine, looked over the wares at a craft fair there inside the winery, and chatted. Bob and Patty are really cool people. Afterwards, we went back to the cute little house, where Tina made dinner and I drank wine. (Seems like a fair trade!) Greg futzed with the new sound system he’d put in place in the house. We talked and laughed and when I went to sleep, I slept soundly, surrounded in peace. 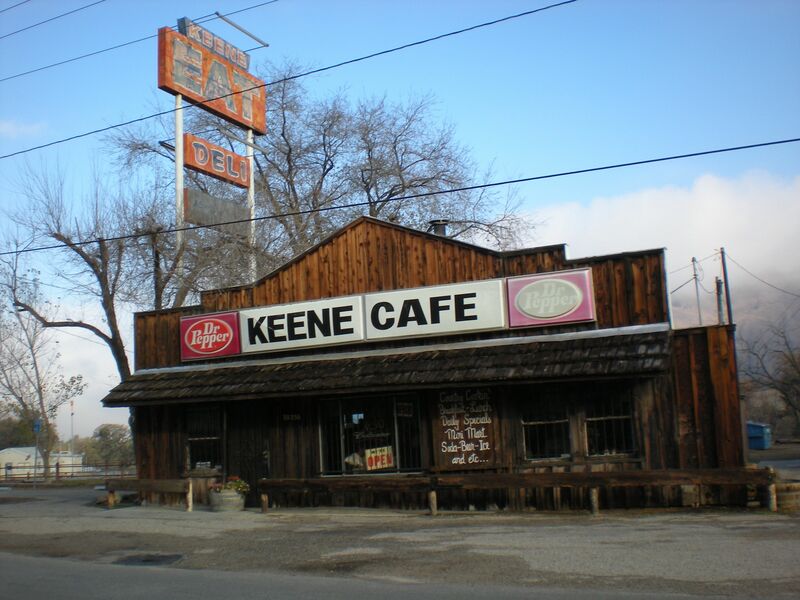 The Keene Cafe – lots of railroad workers eat here. Terrific food! In the morning, we went to the Keene Cafe for an enormous breakfast (that’s all I ate until 7pm that night – fanTAStic ham steak! ), then went to see some sights. 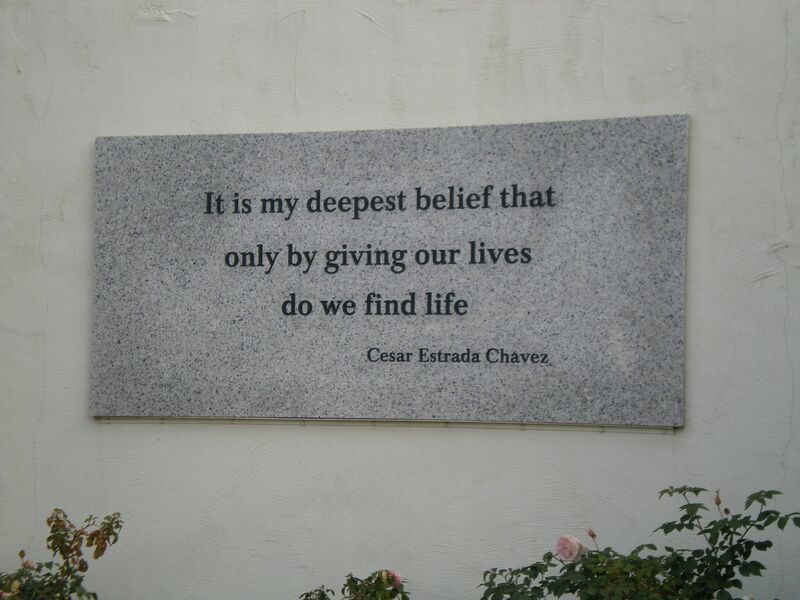 We visited the Cesar Chavez Center and saw his grave and wandered around the peaceful grounds. 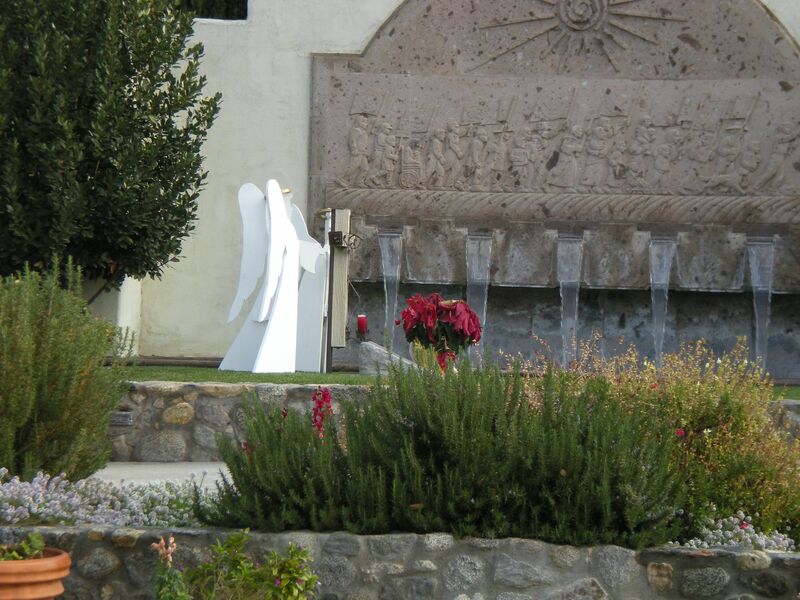 The headstone for Cesar Chavez is between the Angel and the Pointsettia. We drove up the side of a hill so we’d have a good view of the Tehachapi Loop, an engineering marvel by William Hood (“one of the 7 wonders of the railroad world”) built in 1874 – 1876, the train tracks that loop through 18 tunnels and 10 bridges; at one point, if the train is long enough, a train can loop itself three times. 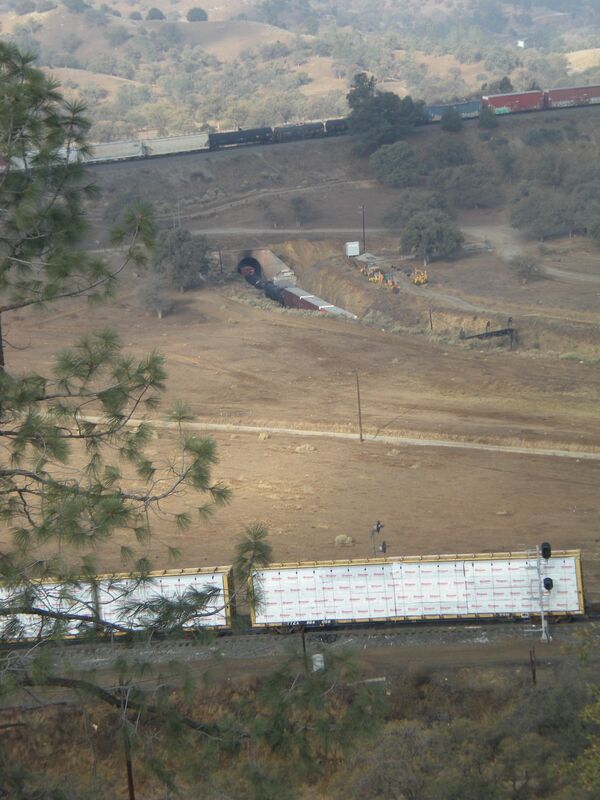 This line is part of the last and final link of the first railroad line connecting San Francisco to Los Angeles. The single track line is still in constant use today, 136 years after its completion. But aside from the Loop, aside from Keene’s Cafe and the Cesar Chavez Center, aside from the flurry of snow that quickly melted and the frost that rimed the grass, the sense of peace was overwhelming. Part of it was the unconditional love that is so much a part of my brother; part of it was the crisp, cold air; part of it was me, without husband, sons, or responsibilities for a few hours. I had been worrying that this Christmas wouldn’t be the “best” Christmas, due to a shortage of funds and a new unwillingness to go into debt just to buy stuff. But after my time in Tehachapi, and after the events in Newtown, I am fine with a simpler Christmas. Blessed that everyone I know and love is well and alive. We aren’t traveling this holiday, and we don’t have guests, so I think perhaps the family will go on a journey of some sort. A photo safari, or local hiking, or a neighborhood we don’t get to very often (there are SO MANY of them in the Los Angeles area). Or maybe we’ll stay home and watch the first season of Game of Thrones. Whatever we do, I shall do my best not to stress, and hold tightly to the peace I experienced in Tehachapi. May you have many blessings, peace, and happy days, from my house to yours. 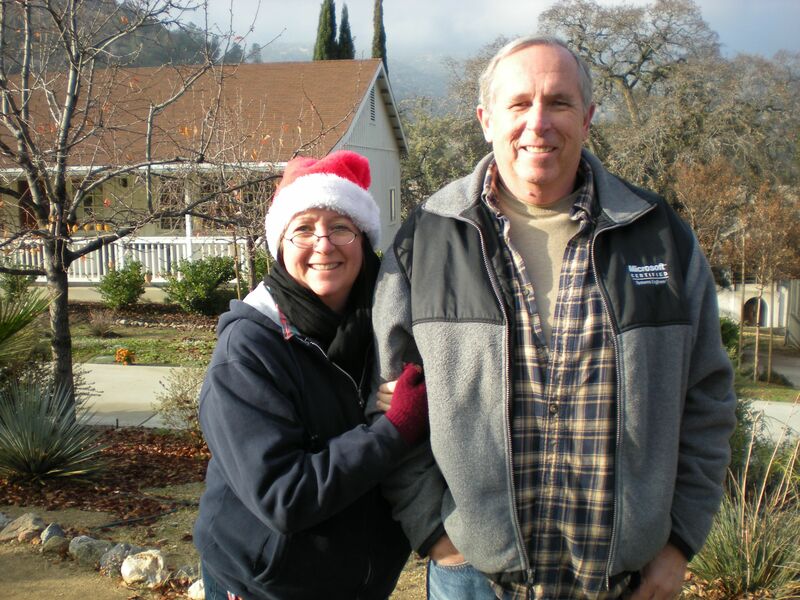 This entry was posted in Life, Observations and tagged Cesar Chavez Center, Christmas, Greg Cunningham, Keene Cafe, Newtown Connecticut, Peace, Souza Family Vineyards, TECHachapi, Tehachapi, The Loop. Bookmark the permalink. Yeah, Tehachapi, I say it and I am soothed. Small-town California can be very interesting. Glad you had a great trip! I definitely need to see more of small-town California! Thanks for dropping by, Aaron! Sounds like you had a wonderful time. I’ve only been up that way once. Sounds like I need to go back and soak in some tranquility. Kathy, I highly recommend it. This is a sure sign you are not a desert dweller at heart – just like me! Okay, so these are still technically desert mountains, but mountains all the same. LOL Enjoy your simple Christmas. We’ll be doing the same, but have plans to go see a movie or two. There’s nothing wrong with enjoying each other’s company without the overblown hype that usually goes with it this time of year. Wishing you and yours a Merry Christmas! It sounds like you had a much needed break and a wonderful time! A change of scenery always seems to help ease the pressures of real life. Thank you for the reminder that the season is about being with those we love. A great post. Thank you for sharing your peace. Glad you were able to experience the peace you realized you needed. It sounds lovely. Have a blessed Christmas and a fruitful New Year. Tehachapi sounds lovely. It’s funny how stepping away from our everyday lives every once in awhile helps snap the priorities into perspective. I’m right there with you on: 1) finding a better way to celebrate peace on earth and goodwill toward men than selling my soul to Visa so everyone can have the latest gizmo that they won’t even want or remember six months from now, and 2) remembering to tell my family & friends how much I love them, because, no matter how you slice it, our time together is a temporary privilege.